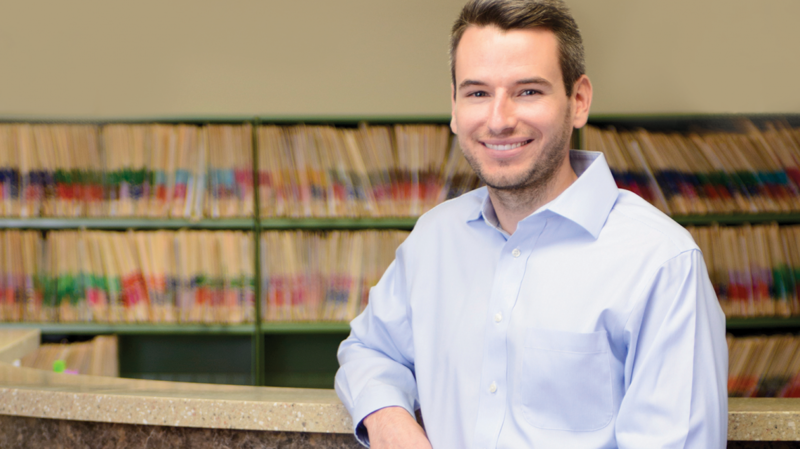 Karl Evanoff, DDS, ’11, owns and operates his own dental practice in Muskegon, MI. As a dentist and small business owner, he takes pride in the positive relationship-based environment his office provides. “As dentistry evolves, often times, the focus is placed on being an effective business. However, it is most important to treat people well. As a dentist, I love being able to express my passion for relationship-based dentistry and cultivating an environment for employees and patients that encompasses this vision,” he says. After graduating from the University of Michigan School of Dentistry, Karl was selected to attend a one-year residency program at Texas A&M University. Furthermore, he earned an Advanced General Dentistry certificate and learned advanced techniques and procedures during the residency. Beginning his career as an associate at a large dental office, Karl learned a lot about himself and solidified his goals. Feeling limited to what he could accomplish as an associate, he began searching for an opportunity to purchase his own practice. That opportunity came in fall 2016 when a dentist who was retiring sold his practice. He thoroughly enjoys running a dental practice, including the challenge of wearing many hats. “In dental school, we don’t learn how to manage an office, handle finances, and human resources. There have been a lot of learning curves along the way; however, it has allowed me to become a better dentist and person,” he adds. When not serving patients, handling business operations and refurbishing the office, Karl enjoys spending time with his wife Deidra, ‘12 (Marketing Coordinator, Evanoff Dental), and their dog Mabel. Whenever possible, the trio makes time to visit Lake Michigan beaches or trek the state’s many nature trails. We believe that dental health is not just about white smiles: it’s about having healthy teeth and gums. Our mission is to help our patients learn about and maintain their oral health in a painless, compassionate, and efficient way. Evanoff Dental is the premier dentist in Muskegon, Michigan. We believe that dental health is not just about white smiles: it’s about having healthy teeth and gums. Our mission is to help our patients learn about and maintain their oral health in a painless, compassionate, and efficient way.